The Great Seal of the State of Montana is a vivid symbol of all that is special about Big Sky Country. The Great Seal evolved from a basic design submitted by Francis McGee Thompson, a representative from Beaverhead County at the First Legislative Assembly at Bannack, the Territorial capital, during the winter of 1864-65. Thompson’s design contained the words “Oro el Plata,” two of the riches that gave rise to the nickname Treasure State. This was changed to read “Oro y Plata,” Spanish for gold and silver. Indeed, it is interesting to note that during the first Territorial legislative deliberations on this subject, consideration was given to using the word “Eldorado” instead of “Oro y Plata.” This proposal was voted down. The seal also features a plow and a miner’s pick and shovel above these words to illustrate the state’s agricultural and mineral wealth. These are surrounded by the mountains for which Montana was named, as well as by the Great Falls of the Missouri River, which so dazzled explorers Lewis and Clark. 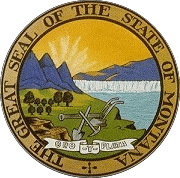 The original designers of the seal were members of a legislative committee chaired by Francis M. Thompson, in the days when Montana was still a territory. Thompson was not without some expertise: he had engraved seals for Montana’s first mining districts on the ends of ax handles. The committee wanted to incorporate into the design the essential elements of Montana’s economy and its natural attributes. The first seal included bison and other animals, but these were removed by later designers who thought the seal was too cluttered. Thompson, who came to the Territory from Massachusetts in 1862, returned to his home state in 1865. His original hand drawn design for the seal is preserved in the Historical Society of Montana. Candidates should not use the Montana state seal on campaign literature. One element of the Secretary of State’s job is to serve as keeper of the Great Seal of the State of Montana. The office grants permission for organizations or individuals who want to use the seal on materials. That permission is typically not given for political campaigns because it would imply that a campaign already had the endorsement of the people of Montana. By law, the Secretary of State is charged with keeping the state seal, and is the only one who has the authority to affix it to public documents, including those signed by the Governor. History: En. Sec. 1, p. 42, L. 1893; re-en. Sec. 1130, Pol. C. 1895; re-en. Sec. 430, Rev. C. 1907; re-en. Sec. 526, R.C.M. 1921; re-en. Sec. 526, R.C.M. 1935; R.C.M. 1947, 19-111. Original sketch of the proposed seal for the Territory of Montana made by Francis M. Thompson, member of the committee on the seal in the first legislative assembly. The classic black-and-white version which every state agency uses as a base. Source and artist unknown.